Discover tips and tricks of winter camping while enjoying the advantages of having a guide. Want to maximize your time in the wilderness? Winter camping can be a lot of work. Bring one of our guides along on the first day of your adventure. They'll help you haul in your equipment, set up camp, and teach you winter camping skills along the way. The guide will not spend the night. They are there to set you up for success so you can better enjoy the winter wilderness. Enhance your winter adventure by bringing one of experienced winter guides along for the duration of your trip. They will help will help you enjoy the wilderness and teach you ins and outs of the Boundary Waters in the winter. Customizable guided day trips into the wilderness. 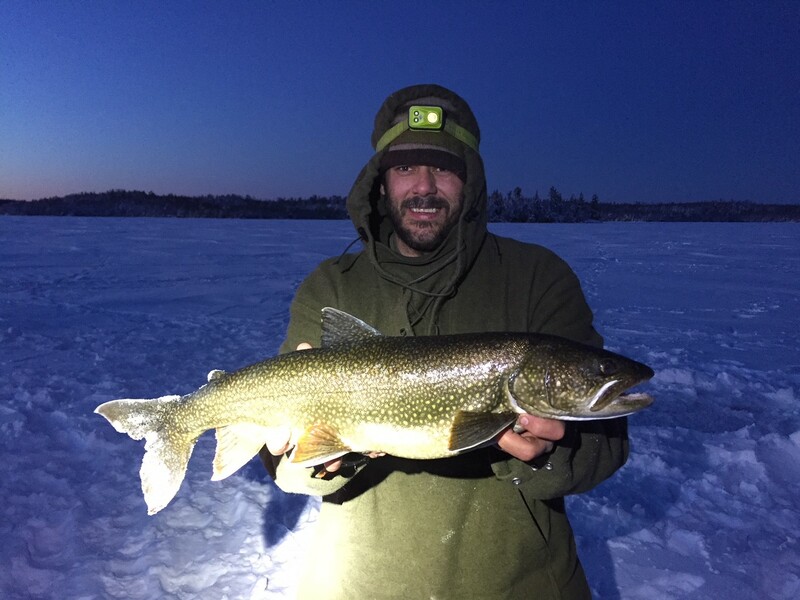 Whether you want to fish, ski, or snowshoe, our guides will give you a taste of Ely and the Boundary Waters during the winter. What do we do for firewood? The guide will instruct and facilitate the identification, gathering, and processing of suitable firewood to be used for heating, cooking, and campfires. It is not necessary to bring firewood although your guide may bring a small amount of pre-processed emergency wood. How will we travel in the winter? The three main modes of travel are cross country skis, snowshoes, and by foot. Snow/ice and trail conditions, along with client preference and ability, will dictate modes of travel. Instruction is available for those who wish to either learn a new mode of travel or improve their current skills. Skis and snowshoes are available to rent. I’m worried I won’t be able to stay warm. How do I enjoy winter outdoor activities and not freeze to death?! Winter definitely poses some unique challenges. Proper layers and material choices make a major impact on the effectiveness of a winter clothing insulation system. Your guide will assist with planning and assembling a system that should provide sufficient warmth for your trip. If you need additional clothing items we have quality gear choices available at our store upon your arrival. Additionally, the canvas hot tent (available for rent) provides a warm shelter to take the chill off should you become cold. Having a wood burning stove with a pot of hot soup or coffee ready can be down-right blissful. Lastly, dietary considerations and fluid intake will affect your ability to thermoregulate your body temperature. Your guide is experienced in techniques to promote this thermoregulation and will work with each client in customizing a plan to make each individual successful at keeping warm. No way! There is plenty to do! Your guide is skilled in many aspects of winter interpretation. You will be provided opportunities to learn about the regions geology, history, lake and river systems, forest ecology, mammal and bird identification, and fishing. Many of these opportunities are present continually at the pace you want to participate. Do I need a guide for the entire trip? No! Your guide is there to provide you with instruction and guidance when wanted and/or needed. One major benefit of having a skilled guide is to assist in the development of skills so that you will feel confident and, more importantly, competent so that you can continue this activity self-directed. You can book your guide for one day, a specific portion of your trip, or for the entire duration. I don’t have fishing equipment but I think I would like to try it. Can I rent the equipment? If you book a guide and request the fishing option, the guide can provide equipment for a small daily fee. There will be additional costs associated with bait and lures if needed, depending on the species of fish targeted and style of fishing chosen (tip-up style or traditional jigging rod). How do we decide on a trip route for winter? Your guide will give you a few options for trip routes based on your desired outcomes, abilities, and the snow and ice conditions observed. Some routes may not be available due to unsafe ice conditions or the risk associated with the abilities of some participants. Safety will always be first when deciding routes for winter trips.